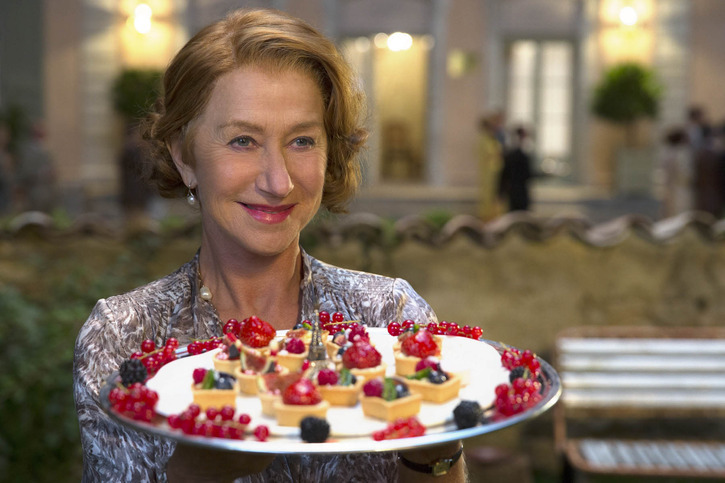 The movie, The Hundred-Foot Journey, brings to mind the song ‘Food, glorious food,’ from the stage musical Oliver! The delicious and mouth-watering fare that passes before the viewer’s eyes, tempt the palate as no doubt, all the exquisite coco-infused creations that were presented in Swedish director Lasse Hallström’s other production, Chocolat. While there are several stars in the movie, the two that shine the most are Helen Mirren as Madame Mallory, the proud, French proprietor of Le Saule Pleureur or the Weeping Willow, and Manish Dayal who plays the part of gifted, Indian food-chef, Hassan Haji. The widowed but snobbish Madame has been coveting a second Michelin star for the past thirty years and is determined to oust the up-start, foreigners who deigned to open an Indian restaurant opposite her. She condescendingly refers to the spice-laden fare as the ‘death of good taste.’ The verbal and oft times, petty duel between Madame and Hassan’s father and owner of Maison Mumbai (House of Mumbai), eventually gets out of control. Indian veteran actor, Om Puri, plays the part of tragically widowed Papa, who, together with his remaining family, flees the political maelstrom of his native country to begin afresh in France. Romance, although in a diffused sense, plays a part between Charlotte Le Bon’s sous-chef character Marguerite and the open and patient Hassan. Marguerite becomes incensed however, when the canny Madame offers Hassan an apprenticeship in her restaurant. Her underlying ambition to become head chef is in danger of being taken over by the talented Hassan. Will romance be relegated to the backburners? Author Richard C. Morais’s story is centred in the south of France in the village of Saint-Antonin-Noble-Val, with its lively marketplace filled with fresh produce and quality products; a picture book forest hiding treasures of truffles; a rough and ready bicycle path that is frequently used by the dainty Marguerite and a river where Hassan tries his hand at fishing. Certainly a picturesque backdrop against the creative, culinary divide! For the fashion-conscious, Madame Mallory’s dress sense and style is impeccably French and is of course, tres chic. Helen Mirren’s slight frame carries off the creations of costume designer Pierre-Yves Gayraud with poise and flair, while Marguerite looks fresh in 50s style dresses and yet, professional in the obligatory checked pants worn by chefs. In an interview with Stephanie Bunbury (Sydney Morning Herald), Lasse Hallström speaks about his feel-good film and his preference for light-hearted romance interwoven with strong characters that interplay within the relationships. What did you think of the movie or the book? If you haven’t read or seen it, does this review entice you to see it? I’d love to hear from you.